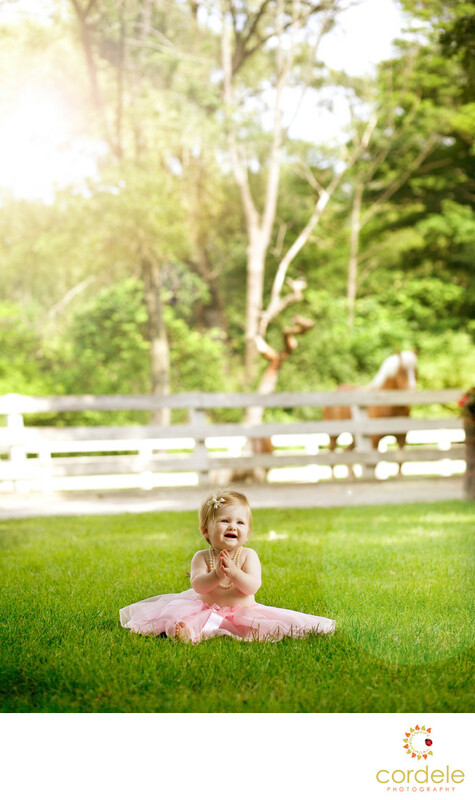 This was a first birthday photo at Brooksby Farm and it was such a lucky photo. It was all about the right time and placement of the subject. The mom dressed the little girl in pearls and a tutu and wanted her to look like a little princess. I had photographed her at different angles and something wasn't quiet what I wanted. I ended up getting down on the ground and looking at her not from above but from her level. What resulted was the horse from the barn coming out and adding to my photos. Without the horse this photo would not be what it is. It would just be a pretty girl sitting on a grassy fieldw with a fence behind her. The sun adds a little element of flare and dramatic effect. The horse makes the photo complete. It now looks like a princess waiting for her carriage which is what I was going for. I took this photo so long ago but it's one of my favorite photos. This was her first birthday and she was ready for a party... or a ball. I didn't need to ask to rent the horse or do anything other than just wait. What makes this photo work is the location. Brooksby Farm is a great location with so many animals and backdrops. Keywords: brooksby farm first birthday (3).